Adult apterae of Utamphorophora humboldti are apple-green with a pair of distinct dorsal darker green broad longitudinal stripes, making it appear to have a pale spinal longitudinal stripe. The antennae are darker towards their apices, and tarsi are dark. The inner sides of the antennal tubercles are converging or nearly parallel, with low conical wrinkled processes. The median frontal tubercle is very low. The siphunculi are pale, or dusky especially on the apical two thirds, and have the apical two thirds swollen. The cauda is pale. The body length is 1.9-2.6 mm. Utamphorophora humboldti alatae have much darker pigmentation, with dark marginal sclerites on the abdomen, as well as intersegmental markings and two rows of rather large and dark paired pleural spots. The clarified slide mounts below are of adult viviparous female Utamphorophora humboldti : wingless, and winged. 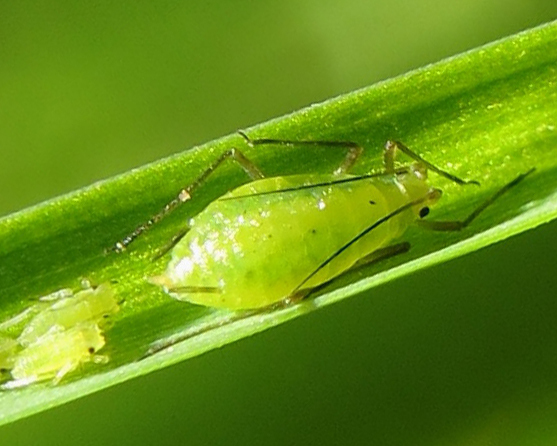 In North America the American grass-leaf aphid host alternates from ninebark (Physocarpus, Rosaceae) to the upper side of the leaf blades or flowerheads of various grasses (such as Poa, Dactylis, Festuca, Lolium). In Europe it mainly overwinters parthenogenetically on grasses. Utamphorophora humboldti is native to North America, but since 1975 has also been found in England, France and The Netherlands. The literature would appear to be a little misleading on the colour of the adult Utamphorophora humboldti when alive. 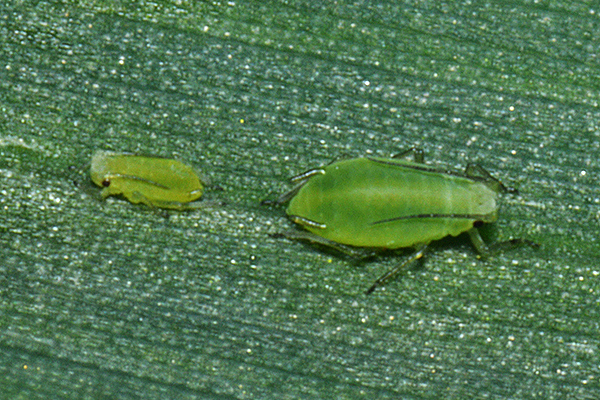 Stroyan (1979) and Heie (1980-1995) state that the adult apterous aphid is "apple green with a light brown head". No mention is made of the stripes in the adult but they do note that "as a nymph it has a pair of distinct dorsal darker green longitudinal stripes." 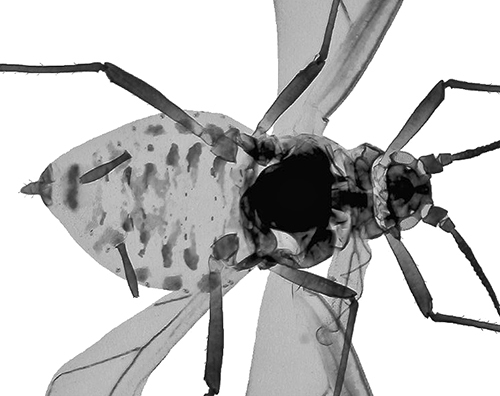 Blackman (2010) does not mention the stripes on either the adult or nymphs. We have found both adult apterae (see above) and immatures (see below) of Utamphorophora humboldti in life have a pair of distinct dorsal darker green longitudinal stripes, making it appear to have a paler spinal longitudinal stripe. The same colour pattern is apparent in the image of the same species from the Netherlands, one of the other European countries where the species has got established in recent years (see below). The same is true for an image of Utamphorophora humboldti from its 'home' continent, North America (see picture below) and in images given by Piron (2010). Image copyright Andy Jensen, Creative Commons (CC BY-NC-SA 2.0). 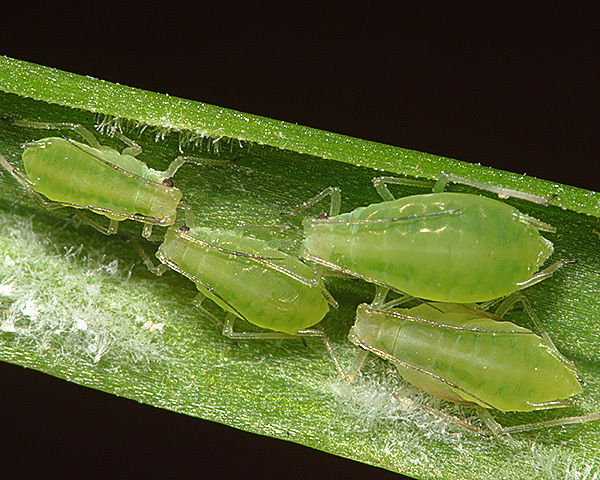 Many aphids have a darker spinal stripe, believed to function as countershading to help camouflage the insect. 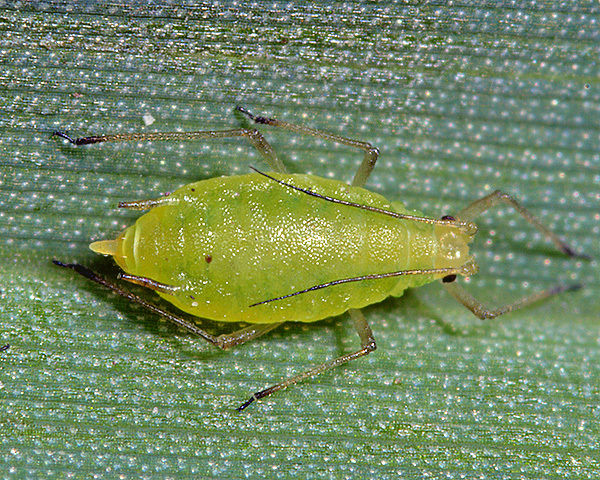 A paler spinal stripe would appear counter-productive in this respect, but may function to break up the outline of the aphid. Prior (1975) first reported the presence of Utamphorophora humboldti in Britain, both in suction traps and on Poa grass. Bell et al (2015) reviewed long-term phenological trends of 55 species of aphids in Britain over 50 years. He noted that Utamphorophora humboldti had the largest increase in numbers caught over the period - which was not surprising, given that species commenced its invasion of Europe in the early 1970's. The species also showed the most dramatic advancement in first flights, the most dramatic shift to later in the year of all last flights, and consequently the largest increase in the duration of flight season. This change in the flight season is most likely an artefact resulting from the increase in population size. 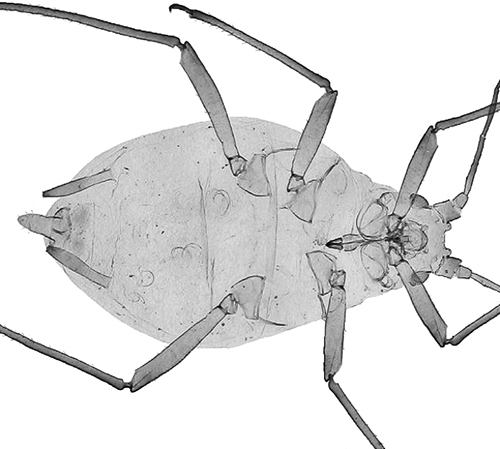 Of those aphid species, Baker (2015) lists 30 as occurring in Britain: Anoecia corni, Anoecia vagans, Aploneura lentisci, Atheroides serrulatus, Baizongia pistaceae, Diuraphis noxia, Forda formicaria, Forda marginata, Geoica lucifuga, Geoica utricularia, Hyalopterus pruni, Melanaphis pyraria, Metopolophium dirhodum, Metopolophium festucae, Myzus ascalonicus, Myzus ornatus, Myzus persicae, Paracletus cimiciformis, Rhopalomyzus lonicerae, Rhopalomyzus poae, Rhopalosiphum maidis, Rhopalosiphum oxyacanthae, Rhopalosiphum padi, Sipha elegans, Sipha glyceriae, Sipha maydis, Sitobion avenae, Sitobion fragariae, Tetraneura ulmi and Utamphorophora humboldti. We especially thank Jochem Kuhnen for the image shown above, and for his kind donation supporting this website. Prior, R.N.B. (1975). 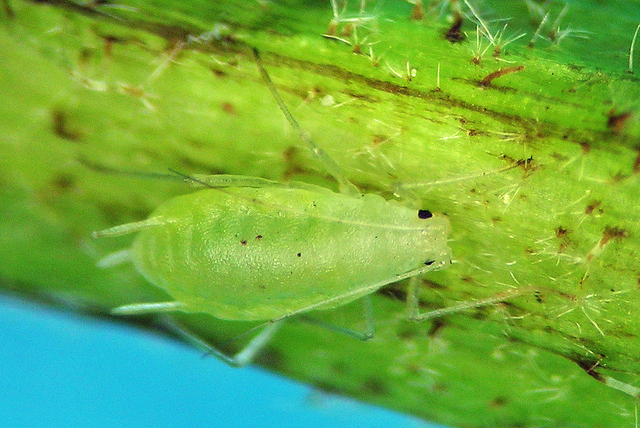 Three North American aphid species recently found in Britain infesting cultivated rose, Cupressus macrocarpa and Poa trivialis. Plant Pathology 24(2), 123-124.